The tibia is the long bone between the ankle and the knee. The undersurface of the tibia as it articulates with the foot is covered in cartilage. Injuries to the cartilage and bone can cause a significant amount of ankle pain. Trauma is the leading cause of injuries to the cartilage at the end of the tibia. Fractures of the tibia into the joint can cause a small or large defect of the tibia. Secondary causes include. abnormal circulation to the end of the bone, certain hormonal or endocrine factors and abnormal stress due to ankle malalignment. Pain in the front part of the ankle that is difficult to pinpoint. Stiffness and soreness of the ankle upon first arising in the morning or after sitting for a long period of time may be present. Usually with walking the stiffness and pain diminishes. A slow progressive loss of motion in the ankle over time. Pain in the ankle with repetitive movements in the up and down position. X-rays are necessary to evaluate the ankle and rule out any bony pathology. Occasionally a small cyst in the tibia itself may be visualized under x-ray. MRI is utilized when x-rays are negative to rule out injury to the tibia. Small areas of cartilage loss and bone marrow edema may be present. Subchondral (under the cartilage) cystic changes may also be noted. MRI may show sclerosis around the defect (hard white bone), which may be indicative of a chronic condition. CT scans are often needed if MRIs fail to completely evaluate the extent of the injury. CT scans will show the exact bony pathology that may be present in the ankle. Conservative care for acute injuries includes rest and immobilization in a cast or boot to prevent trauma and stress to the ankle. Clinical judgment is necessary as to whether crutches may be necessary. This could be for 4-8 weeks. Physical therapy to improve range of motion in a joint that has little motion will also help to improve the condition of the ankle. 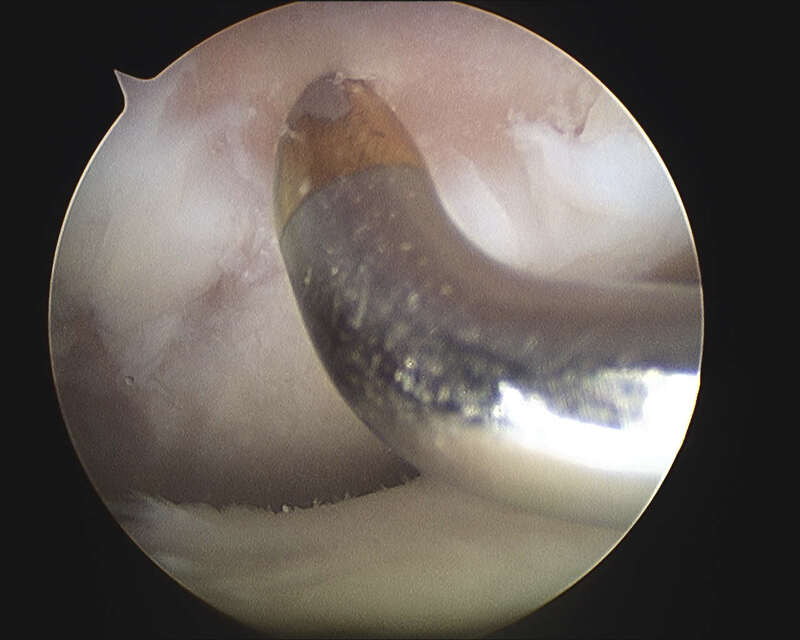 Arthroscopic debridement of the defect may be necessary if conservative care fails to alleviate the pain and stiffness in the joint. The procedure is done on an outpatient basis under a twilight or general anesthetic. Once the procedure is performed, within 18-24 hours the ankle starts to move to prevent scarring, swelling and a recurrence of stiffness to the joint. Nonweightbearing for up to six weeks may be necessary. For small defects of the tibia, the prognosis is excellent. Large defects have a poor prognosis and ultimately arthritis may develop in a joint. 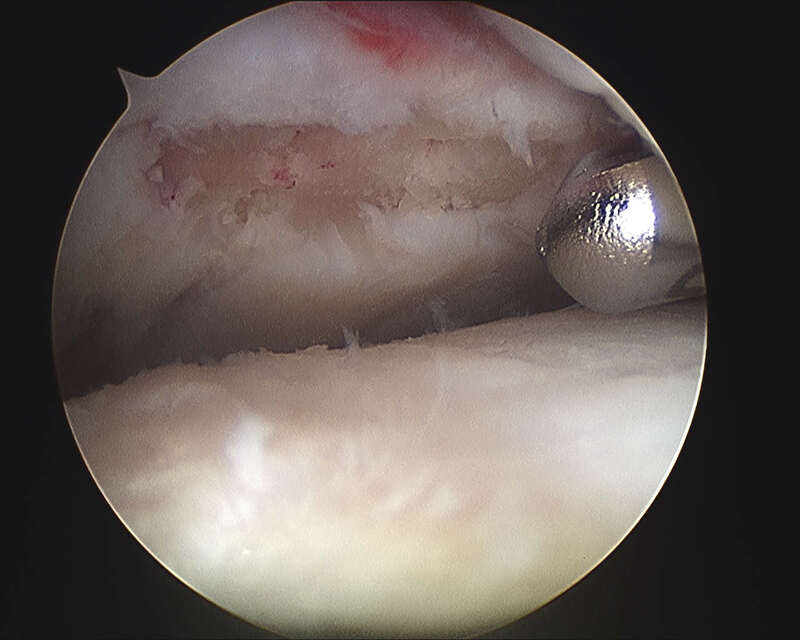 Pic during microfracture of tibial OCD.